Ronaldo7.net and SBEN are proud to announce a new alliance. Some future Cristiano Ronaldo contents, will now be linked between both websites, written in Spanish and English language. 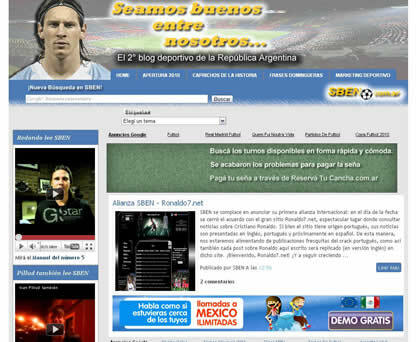 Ronaldo7.net is proud to announce that we established an alliance with the Argentinian blog SBEN ( "Seamos Buenos Entre Nosotros"). SBEN is a blog dedicated to publish the most relevant sports news, from all around the world, with a particular focus given to Argentina and Spain events. SBEN experienced editorial team, offers their visitors a wide variety of unique news articles, displayed in Spanish language. This is a very popular blog in Latin America and the last rankings published indicated they are the 2nd most visited sports blog in Argentina. The alliance between Ronaldo7.net and SBEN will consist in providing some of our future news articles, written in both English and Spanish languages. Every news articles that will be available to be read in SBEN, are going to have a direct link indication on the top of the page, which will lead you to SBEN. We are confident our visitors will be very satisfied with this alliance, since it represents another step into one of the main goals of this project: Become the main source for every Cristiano Ronaldo fan.